One of the questions I often get is if F&B take the same lunches to school. The answer is sort of yes and no. I typically adjust fruit and veggies according to preferences (Ben loves all berries and kiwi, Faith does not, whereas she loves cucumber and lettuce with dip and he will not eat it). Their main meal is generally the same. It's rare that one takes muffins and one takes a sandwich, for example. For my own sanity, it's usually pretty close. These two lunches pictured are from last week and are basically the same. They each took a sandwich, cut with one of our LunchPunch cutters--flowers for Faith, a truck for Ben. Although I can't remember which now, one is turkey and the other is ham, per request. Switching meats takes me no extra time. 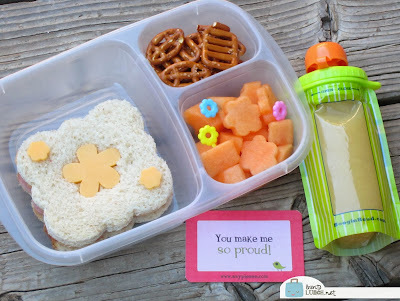 They both had pretzels and cantaloupe, but the picks match their lunches, along with a pouch of applesauce in a Squeez'ems pouch. 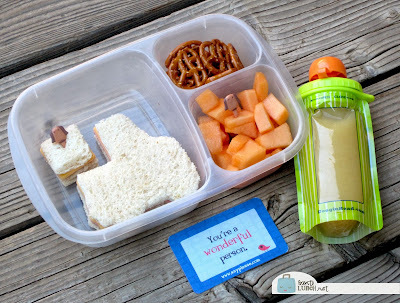 Of course, they each had a Lunchbox Love note, and since it was a day needing separate snacks, we used our EasyLunchboxes to take advantage of all the cooler bag space.